These are a couple of my good friends, only minutes after the rocket attack in the previous photo. 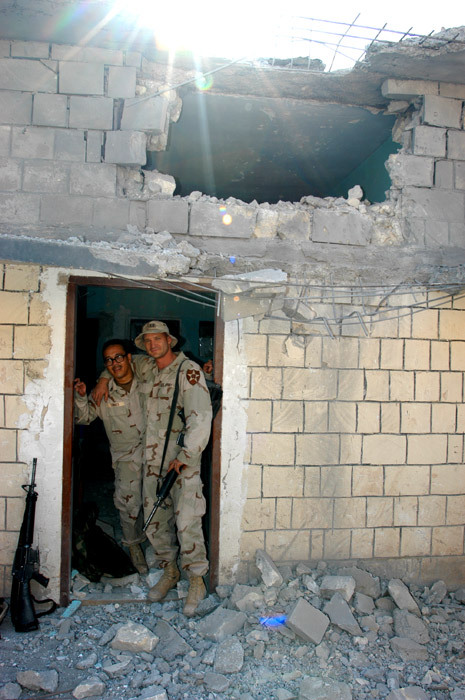 They are smiling because this is their office and they were not in it when the rocket hit. The 107mm rocket absolutely devastated the office, and caused some damage in all the offices in this building. My own office is just to the right in the photo and I was sitting at my desk when the round hit--a distance of around five meters. After I searched these offices and put out a fire started in the blast, we organized our guys, cleaned up the rubble, got the electricity working again, and continued our work. I was amazed at the guts and determination of these Soldiers, weathering a direct impact from an impressive munition, shaking it off, and just doing their jobs. This room ended up being the future site of the Café Ar Ramadi, which you will see later in this photo series. One of my soldiers was injured by this blast. Specialist Jonathan Town was outside sorting mail when a rocket hit nearby and he ran into our office, just before the second rocket hit this building. He was just inside the door and I saw the rocket explode around a meter from his head. Specialist Town was awarded the Purple Heart for his injuries. When we returned to the states, he suffered from Traumatic Brain Injury (TBI) and Post Traumatic Stress Disorder (PTSD). Even though his medical issues were well documented, he was discharged from the army for a "personality disorder", which basically was a way of screwing him out of benefits and compensation for his injuries. Treatment of soldiers at Fort Carson, Colorado for TBI and PTSD would come under suspicion and would eventually be investigated by congress.